The Companion GO-Plus™ comes with 1 DC socket and 2 USB power ports allowing you to use your car cigarette lighter to charge more than one portable electronic device at the same time. Now you can also charge your mobile phone, MP3 player, or tablet/e-reader while using your GPS on the go. Simply plug in and use! It was in 1983 when WAGAN Corporation entered the market and saw the need for innovation in the automotive accessory business as well as a need for quality products to fit in today's high-tech and busy lifestyle. During the early 1990\xCDs WAGAN introduced the \xF1Wooden Bead Seat Cover\xEE (WBSC) and sold about 4 million pieces each year. The WBSC was distributed everywhere from department stores and retail chains from Sears, The Sharper Image, and Safeway, to convenient stores and neighborhood drugstores. Gearing towards today\xCDs mobile professional, the WAGAN Tech\xBB Mobile Consumer Electronics and Power Inverter series are used in vehicles and planes to run electronic appliances as if they are running in a SOHO environment. WAGAN's Power Supply line provides emergency power for household appliances, computers, and fax machines for the unexpected blackouts or simply while traveling. Now, as WAGAN Tech Line, products are making the consumer driving experience comfortable as well as enjoyable. Our products are making it easier for today's mobile professionals to do their job and fulfill their needs. We are constantly developing new products to tailor the vehicles into tomorrow's high-tech "Office-on-the-Go". 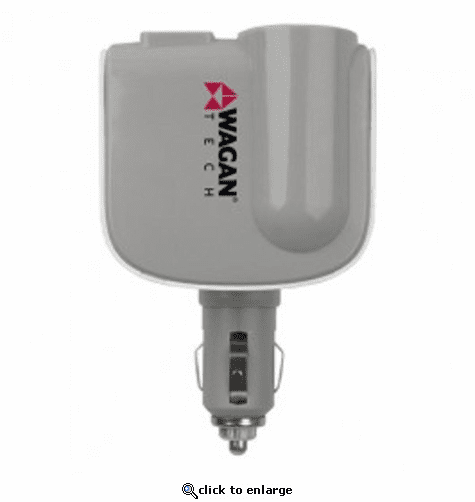 The WAGAN Corp warranty is limited to products sold only in the United States. All products must be registered within (30) days of purchase to activate warranty. Register your product with WAGAIN today! Be sure to keep the original receipt as it will be required when returning a product under the warranty. Warranty duration depends on specific product.